When you look back at guitarist Steve Vai's early career as Frank Zappa's extra pair of notating hands (and touring band member), it's understandable just how technically stunning his work really is. Vai began transcribing Zappa's 'Joes' Garage' album, eventually having them all published in the early '80s, alongside notations of the 'Shut Up and Play Guitar' series and just after being enrolled as a full-time member of Zappa's live band. To put things into perspective, this was on a par with being Bruce Dickinson's co-pilot or Elton John's jeweller. After gleaning all that unforgettable experience, Vai went solo in 1983 and released his debut album, 'Flex-Able', a more than fitting title for the man's ability to wield an axe and produce an amalgam of riffs and sounds that appear seemingly impossible to some mortals. Perhaps his most familiar contribution to non-metal and straight-rock fans is his appearance on PiL's 1985 set, 'Album'. Back in the rock world, he's been in Whitesnake, David Lee Roth's band, Graham Bonnet's band and, of course, the successful Dweezil-fronted Zappa Plays Zappa tour (during 2006). 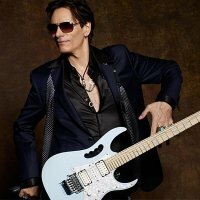 2012 will see the return of Steve Vai as a recording artist with 'The Story of Light', his eighth studio album and his first for over half a decade. According to an interview with MusicRadar, the new album will feature the enormous title-track, a bit of seven-string action on 'Velorum' and a cover (of sorts) of the blues-roots classic, 'John the Revelator'. You will no doubt get to hear all of these in the flesh when Vai hits these shores in December! Stops on his UK tour include Portsmouth on 1st December, followed by Hammersmith, Wolves, Newcastle, Ipswich and finally (for now) Manchester on the 7th. Tickets are on sale from us on Friday 10th August, priced from £27.50 (£28.50 for London).